There are so many things to do in Hida Takayama (高山)! During our 12 days of travels to Japan, we made a trip from Mount Fuji to Hida Takayama via a 5 hours bus ride. In this post, we’ll show you all the MUST-DO things in Takayama as well as the foods and drinks to try in Hida Takayama (高山)! Thanks to Yasufuku, we get to enjoy high quality Takayama Hidagyu Beef today! Check out the marbling of the A5 Hidagyu at Hida Takuma! No trip to Takayama can complete without eating the famous wagyu – Hida Takayama Beef (飛驒牛). In fact, there are many travellers who make a trip to Takayama JUST to try out this famous Japanese beef that is melt-in-your-mouth awesome! The Hida Takayama Beef (Hidagyu) is classified as an A5 premium grade beef because of its amazing marbling texture as well as the abundance of this precious wagyu meat in a cut. Just look at the marbling (above) of the sukiyaki we had! Being a town famous for its wagyu, you can find Hida Beef at almost every restaurant in Takayama. In addition, there are many ways to enjoy Hida Takayama Beef. 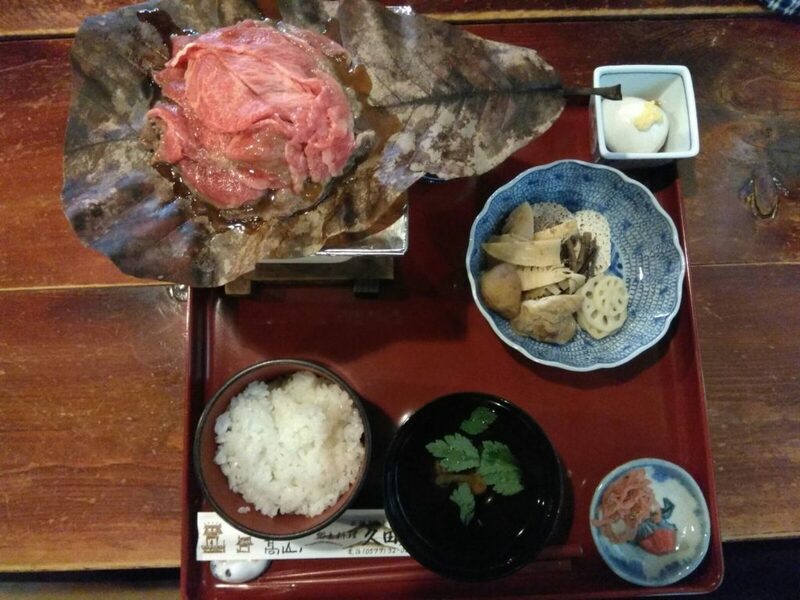 You can have it the traditional way – hida beef over hoba (magnolia) leaf or the hida beef sukiyaki. Other forms include the hida beef bun (not worth it), hidagyu yakiniku and even the hida beef sushi! :O Find out more in our post of “Everything You Need To Know about Takayama Hidagyu Beef“. The Torii Gate at Miyamae Bridge is another attraction of Takayama. Towering over the Miyagawa River, the Torii Gate at Miyamae Bridge is not only a landmark of Takayama, it also leads to the famous floating exhibition and shrine in Takayama. A picturesque spot not to be missed while you’re in Takayama. Other than Takayama Hidagyu, hida ramen is also a famous local staple characterised by its thin yellow and chewy texture. We also managed to savour a soba set at the Takayama preservtion area. Lastly, we tried out some desserts at a local cafe including matcha cake, squarish egg and the baumkuchen! During our visit to Takayama, we stayed at Country Hotel Takayama because of its location. Located just across the Takayama JR Bus Station, it is almost impossible to miss this tall hotel with Family Mart at its first level. For an added upgrade, you can consider the Best Western Hotel Takayama for its spa facility or visit the Takayama Ouan Hotel for an authentic ryokan experience, complete with a rooftop onsen! We hope you have enjoyed our coverage of the top 6 things to do in Takayama! Enjoy your next trip to Hida Takayama and let us know your thoughts in our comments section below! City Suites Ramos Tower: Good location with Great view!